Why we celebrate Valentine’s Day and an idea to impress your loved one? With the Festive Season behind us for another year, we look for other reasons to bring fun and good spirit to the cold winters days – like celebrating Valentine’s Day. February is a month where shops are filled with red heart shaped goodies, cards and bunches of red roses. Have you ever wondered why we celebrate Valentine’s Day on the 14th of February and what the history is behind this day of romance – in fact for many, February is known as the month of romance and not just one particular mid-month day. Well the story starts with St. Valentine. Well legend has it that in 270 A.D there was a clash between a kindly priest and a mighty ruler. And, so begun the story and tradition. It is not exactly known why the 14th of February is known as Valentine’s Day or if St. Valentine really is the reason for the celebration as it is only legends that are our source of information. One legend has it that Valentine’s Day originated from the ancient Roman festival of Lupercalia, a fertility celebration that was observed on the 15th February of every year. But, with the rise of Christianity in Europe many pagan holidays were renamed to dedicate them to the early Christian martyrs instead and so the festival of Lupercalia was changed into a Christian feast day and celebrated a day earlier on 14th February. The then Pope Gelasius proclaimed that day to be one of feasting in honour of Saint Valentine, a Roman martyr and now for whom modern Valentine’s Day honours. Saint Valentine, believed to have been a bishop, held secret marriage ceremonies of soldiers. This angered the Roman Emperor Claudius II who had prohibited marriage of young men because he felt that they would be more emotionally attached to their families, and thus, wouldn’t make good soldiers. He believed that marriage made the men weak. So he forbid marriage to ensure quality soldiers. When Valentine’s actions were discovered, Claudius ordered that he be put to death. Other legends suggest that St. Valentine may have been killed for attempting to help Christians escape the harsh conditions in Roman prisons, where they were often beaten and tortured. And yet another legend talks about an imprisoned Valentine who sent the first “valentine” letter himself after he fell in love with a young girl, possibly his jailor’s daughter who visited him during his time in confinement. Before his death, it is alleged that he wrote her a letter signed “From your Valentine,” an expression that is still used today. Although the truth behind the Valentine legends are hazy with nothing ‘cast in stone’ to prove the course of events, the stories all emphasise St Valentine character as a sympathetic, heroic and, most importantly, a romantic figure. But, it is thanks to these stories that by the Middle Ages, Valentine became one of the most popular saints in England and France. Valentine greetings were popular as far back as the Middle Ages. The oldest known valentine card is still in existence today – it was presented as a poem written in 1415 by Charles, Duke of Orleans, to his wife while he was imprisoned in the Tower of London following his capture. Several years later, it is believed that King Henry V hired a writer named John Lydgate to compose a valentine note to Catherine of Valois. The exchange of hand-made valentines dates back to the early 1700s. Commercialism started as far back as the 1840s, when the first mass-produced valentine cards were produced – they were elaborate creations made using lace, ribbons and colourful pictures. Today, according to the Greeting Card Association, an estimated 1 billion Valentine’s Day cards are sent each year, making Valentine’s Day the second largest card-sending event of the year. (Christmas is the biggest card sending – includes eCards) Interestingly, it is women who purchase approximately 85 percent of all Valentine cards. With that bit of insight into how Valentine’s Day has come to be, perhaps the reason to celebrate it is more than just commercialism, but rather a day to rejoice the love we share with some one special. How do you plan on celebrating Valentine’s Day 2016? Need any help? If a night or two away with a loved one sounds like the perfect plan, then why not consider booking into a serviced apartment? They are a ‘home-away-from-home’ with all you need to stay in, keep warm and enjoy each others company. Kick-off your shoes and get comfy in a pair of complimentary slippers. Then take in a movie or two from the many choices SKY movie channels offer. If you want to really impress your partner, you can show-off your culinary skills in the fully equipped kitchen which has all the appliances, pots, pans and utensils needed to get creative. The open-plan kitchen and living area means you needn’t be apart while preparing a meal. Set the scene for a romantic meal and dine at the dining-table in style. 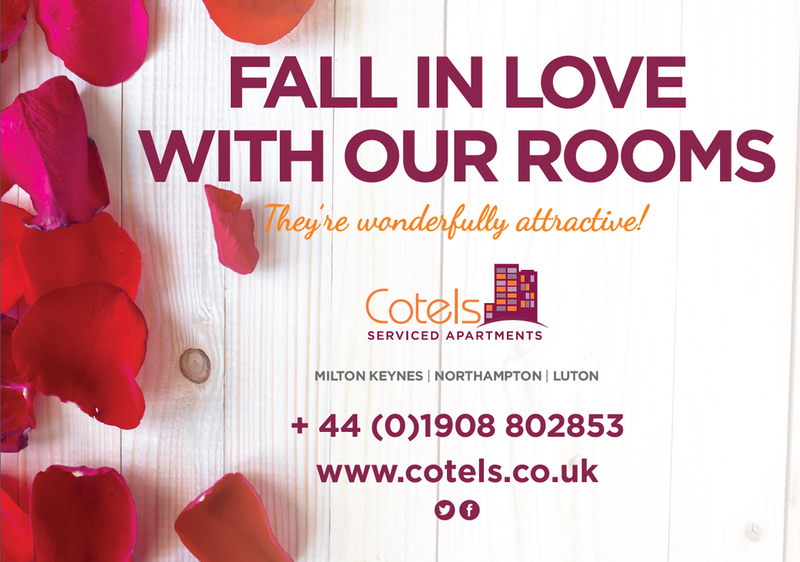 If, you need some fresh air or want to get out and about, Cotels have serviced apartments located in central Northampton, Milton Keynes or Luton – all within a short walk or car journey to many shops, restaurants, cinemas, pubs, sports amenities and to parks or country walks. Why wait? Either book on-line, call us on 01908 802853 or e-mail us info@cotels.co.uk to book your Valentine break in one of our serviced apartments. Rates are fully inclusive so there won’t be any extra charges added to your bill at the end of your stay.